North Carolina U.S. 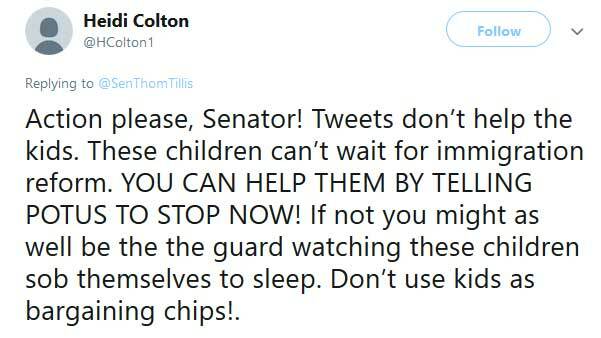 Senator Thom Tillis took to Twitter to state his disapproval of the controversial practice of separating immigrant children from their families at the border. 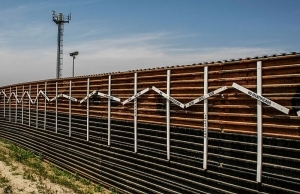 Under mounting pressure, Tillis urged Congress to adopt an immigration reform policy that would be compassionate to children, but also discourage illegal border crossings. 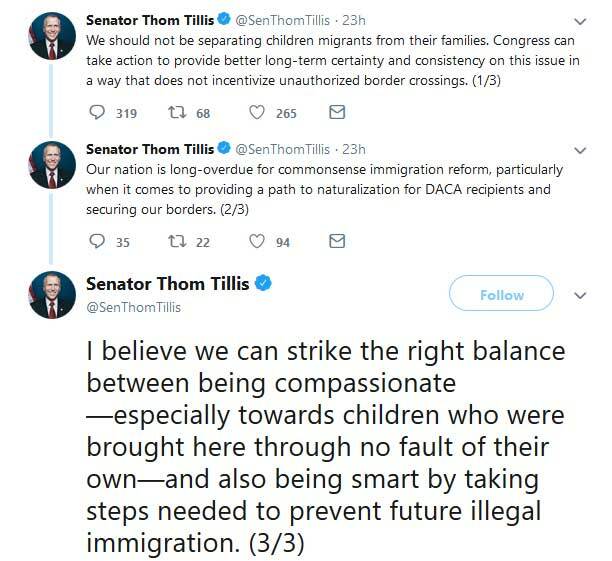 Tillis’ three tweets were met with numerous calls for him to go a step further and co-sign the Keep Families Together Act. SB 3036 has been signed by every Senate Democrat, and (as of this writing) yet to attract any Republican Senators. North Carolina Senator Richard Burr has yet to issue a public statement on the ‘zero tolerance’ policy. Learn more about the Keep Families Together Act. Even by the standards of what has become a disturbing status quo as of late, the past month has been plagued by dehumanizing rhetoric and violent actions directed at immigrants and children of immigrants. It is part of a growing and horrifying narrative encouraging violence and reprisals toward the immigrant community in our nation – stemming from the highest office in the land. As Policy Watch reported earlier this week, Education Secretary Betsy DeVos recently said schools should report undocumented students in their schools. The entire Trump administration has doubled and tripled down on calling immigrants “animals” while border patrol agents shot and killed an immigrant woman. Meanwhile, President Trump called the immigration court system corrupt and suggested eliminating judges and trials. He is also suggesting cutting aid to countries based on their immigration flow. Carolina Fonseca has always been a dreamer. It’s not a term she came up with on her own, but it’s one that has been very relevant to her life. Fonseca’s parents brought her over from Mexico when she was a young girl and she lived many years as an undocumented immigrant and then as a DACA (Deferred Action for Childhood Arrivals) recipient before getting permanent residency. 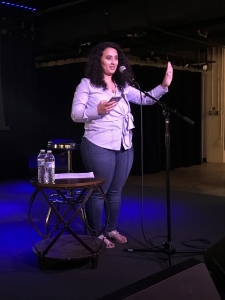 Fonseca was one of four people at a storytelling event Thursday hosted by the NC Justice Center’s Immigrant and Refugee Rights Program. 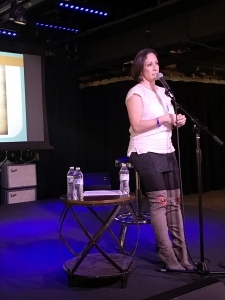 The event was titled “This Journey: Stories of Immigrants, Refugees & Advocates.” The NC Justice Center is the parent organization of NC Policy Watch. She talked about the guilt she still feels over getting residency status in the U.S. over others and said it’s important for her to keep telling her story to help others. “People can see who you are and not just who the news says you are,” she said of speaking out. Her struggle helped push her to the path she’s on (she’s writing a children’s book) and she is proud of her history. “We always have to remember where we came from because our culture is beautiful — don’t ever let anyone take that way from you,” she said. Eighty-year-old Terry Grunwald spoke after Fonseca with a different perspective about immigration. Her father escaped Nazi Germany during World War II and sought refuge in the U.S. He was forced by a judge to go back, but by political chance ended up being able to stay. 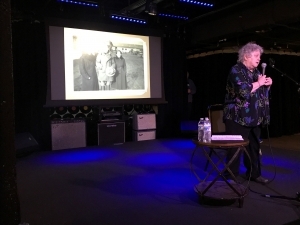 Grunwald said she has been telling her father’s story for 80 years and there are still very real echoes of the past in other immigrants’ stories. 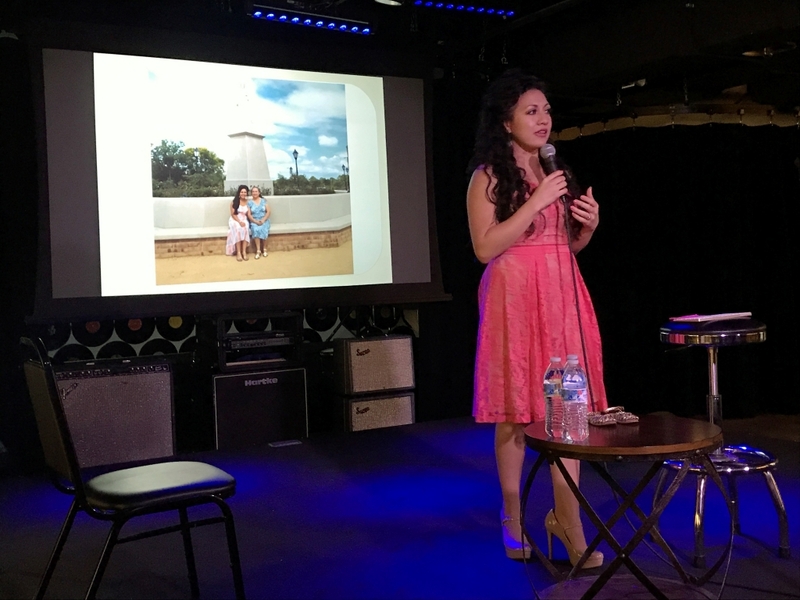 Angela Salamanca, who owns Raleigh businesses Centro Mexican Restaurant and Gallo Pelon, spoke about her experience building a life in the Triangle as an undocumented immigrant from Colombia. She landed in North Carolina after being denied admission to a university in Bogotá, Colombia, and the plan was never to stay. But Salamanca quickly learned that she loved life in America. “I was able to be whatever I wanted to be,” she said. Salamanca said 1995 was a different time for immigrants and she was able to get a social security card and driver’s license — basic documents, she said, that were able to open a lot of door for her. She eventually got residency status in the U.S. and is now working to get her mother here after being away from her for so long. “I’m proud to be an immigrant in this country, and I’m proud that I landed in Raleigh,” she said. Lela Ali was the last speaker. She identifies as an Afro Arab Immigrant Muslim but said she struggled a lot with her identity and with being an immigrant growing up. As a child, she said, she didn’t quite grasp what undocumented really meant. “It meant relunctantly and painfully not being able to admit who I was,” she said. Ali couldn’t get a driver’s license when she was 16; she had to pay more to attend college, couldn’t apply for financial aid and didn’t qualify for many scholarships. “At that moment, the American dream was shattered for me,” she said. But she pushed on and eventually got a scholarship, “the golden ticket,” it was described to her. It was her only and single way into college but it also left her with a sense of guilt and the reality of privilege that other immigrants didn’t have. “So many other young immigrants just like me couldn’t get the golden ticket,” Ali said. She’s gone on to build a life for herself and become comfortable with her identity. She was empowered, she said, by knowing her history and culture, and she encouraged others to as well. Ali said her mother once read her an Arab proverb that stuck with her. “Those that are without knowledge of their histories are like trees without roots,” she quoted. Hispanics have been at the center of the controversial national debate over immigration. What seems to get lost in the controversy is the pivotal role Hispanic immigrants play in North Carolina’s economy. They make up nearly 30-percent of the workforce in farming, fishing and forestry and about 20-percent of the construction workforce. Their buying power contributes more than $10 billion a year to the state’s economy. This evening WRAL-TV will air its latest documentary “Land of Opportunity” at 7:00pm. 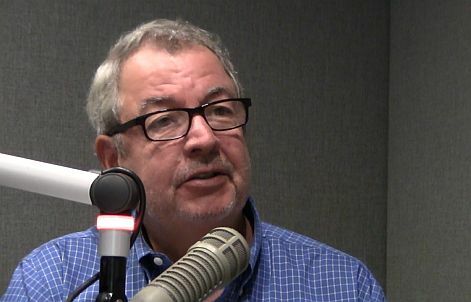 This half hour doc profiles three successful Hispanic immigrants and examines their contribution to North Carolina’s economy and our communities. This Halloween there are a lot of scary policy ideas out there that keep coming back from the dead. Some policymakers at both the state and federal level have been so relentless in their pursuit of policies that will hurt people and communities across our state that they want to change the very rules that govern us. We plan to match that zombie-like commitment to failed ideas with timely analysis, relentless mobilization, and alternatives that will work for our state. Because cutting off opportunity from people and erecting more barriers will take us further away from building a state where every community has the tools to deliver a high quality of life and every North Carolinian can connect to opportunity. North Carolina needs policies that won’t set us on a path to a terrifying future. That is why this Halloween we are continuing to fight back with sound, timely analysis, and the mobilization of voters across North Carolina to show the terrifying future our policymakers seek to create is not the right way forward for our state.